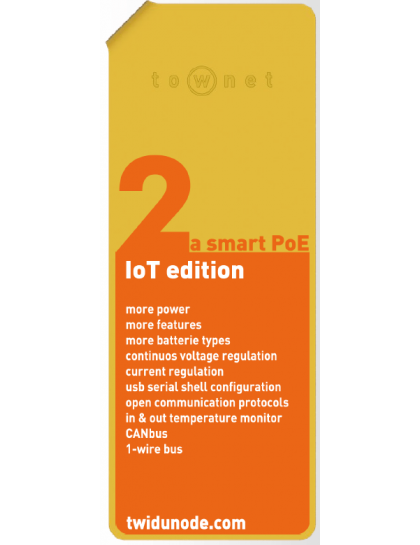 Thanks to smart PoE supply every standard and not standard load such as PoE+, 802.3af & 802.2at devices, IP-Cameras, IP-Phones, PBXs, Access Point, Switches, CPEs, Routers, providing Output Voltage in case of black out. The Output supply is selectable in continous way between 24V up to 52V. Thanks to select 24 or 48V PoE Gigabit is ideal solution to supply a wide range of devices. an integrated strong Lightning Protection from overvoltage and shocks. a recharger for 12V battery allow to improve a complete UPS system. One battery more PoE for recharge toghter one big battery, no SPOF technology (Single Point Of Failure). Din Clip located in a rear side of device permits to align more TW-IDU-NODE to the same Din Bar. The installation is fast, safe and reliable, reducing dimensions. Embedded microprocessor with I/O & ADC (Analog to Digital Controller) ports collects energy station data such as data log, input/output voltage, supply status, current monitor, temperature monitor etc. It is possible also without supply. Device perfomance can be controlled in remote way by means OS Node operating system. The management can be realized with PC or Tablet. Buying or OSNode and downloading configuration is possible to activate the interface in own device.